The building maintenance checklist is an essential requirement for the proper management of a property. The checklist assists you in organizing and consolidating the various responsibilities that are necessary for ongoing building maintenance. It is also convenient because it specifies the time-period for inspection for each issue, which will also save you money in the long run by efficiently focusing your attention on the relevant issues which need to be addressed. Some requirements, such as smoke-alarm inspection, will need attention more frequently than a larger scale structural inquiry; likewise, certain cleaning responsibilities may be required daily while others may be necessary only once or twice a year. The number of responsibilities to keep track of for successful building maintenance can be overwhelming, so utilizing a building maintenance checklist is a crucial aid which will make your job much easier. Utilizing the template effectively is easy, and can be downloaded free of charge right here on this site. 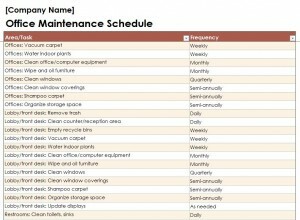 Once you have downloaded the building maintenance checklist to your computer or tablet, you can begin to use it immediately. First, enter the company’s name at the top of the document; you can adjust the font and type size to your specifications. Enter the location of the building and any further information about it such as square footage that you may feel is relevant. Additional fields can be added or existing ones can be enlarged. The checklist itself is also fully customizable, and the entries recorded throughout the building maintenance checklist can be changed to match the needs of your particular property. Remember, your building maintenance checklist is meant to help you organize your time effectively. The frequency column will assist you in keeping up-to-date on the various tasks required for successful building maintenance. Over time the required tasks might change. Make sure to periodically review the list of tasks and confirm that they are current. Keep an eye out for any patterns that may appear, such as certain tasks requiring attention more often than indicated in the frequency column. The frequency can always be updated if needed. The building maintenance checklist is your ally in the field. Refer to it often and look to it as your guide, as it will help you manage your property efficiently.